Flasks such as these were made for Europeans in colonial India, Batavia and possibly Sri Lanka. They served as cooling flasks for wine or water, and worked by allowing the liquid inside to gently seep through the porous body and evaporate thereby cooling the contents. In this respect they differ from cooling flasks of seventeenth and eighteenth century northern India made for local Muslim clients. These were encased in textile covering which was then soaked in saltpetre to cool the contents. Both flasks comprise globular, gadrooned bodies fashioned from a composite material possibly with the inclusion of marble chips. They are moulded into the shape of a fruit or nut, and have silver tiered bases and silver shoulders, necks and domed stoppers with bud-like finials. The necks widen as their tops are reached and are double skinned with the space between the outer and inner silver walls being filled with a composite material thereby strengthening them. The stoppers, which fit tightly, are attached to the necks by means of silver chains, which are original. The bases and the shoulders are decorated with repeated serrated foliage-like edging which is embellished with engraved decoration. The bases are not identical. Although most probably moulded they differ in shape slightly. Also, one is slightly larger than the other. 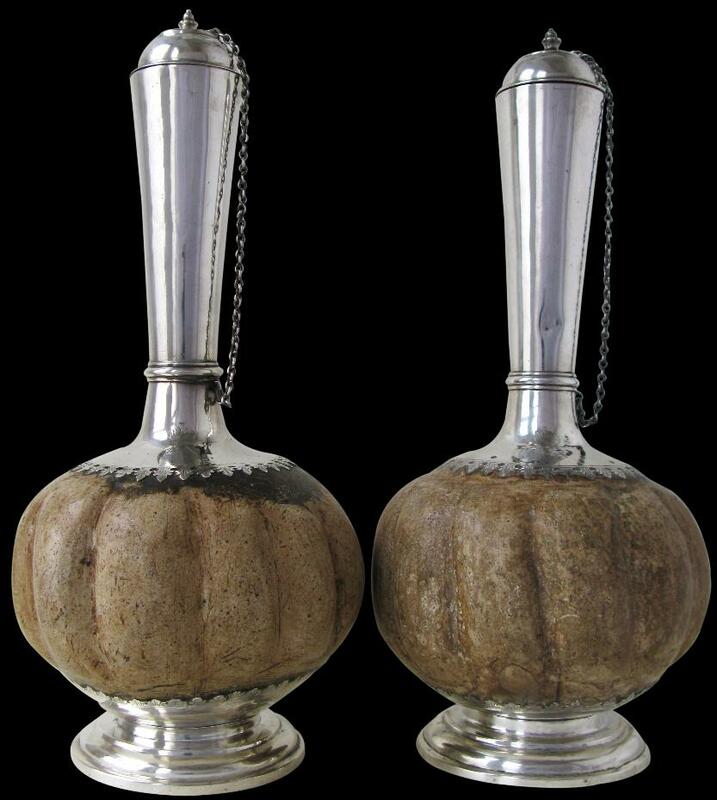 Stylistically, the flasks have both seventeenth and early eighteenth century elements. Wassing-Visser (1995, p. 38) says that flasks of this nature were mentioned in 1673 and 1676 in the inventories of the property of Amalia van Solms, consort of Prince Frederick Henry of the Dutch royal house who worked closely with the Dutch East India Company (VOC). et al (1998, p.99). 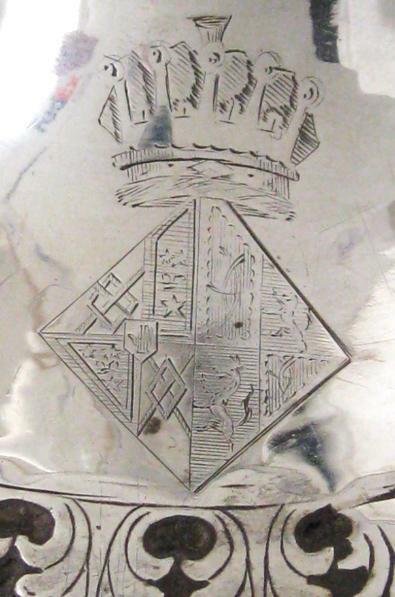 It is attributed to late seventeenth or early eighteenth century Batavia and has Batavian assay marks. It has a chain which attaches the cap to the neck, a long neck which flares as it reaches the top, a tiered foot, and a silver bulbous body which has slight gradrooning. 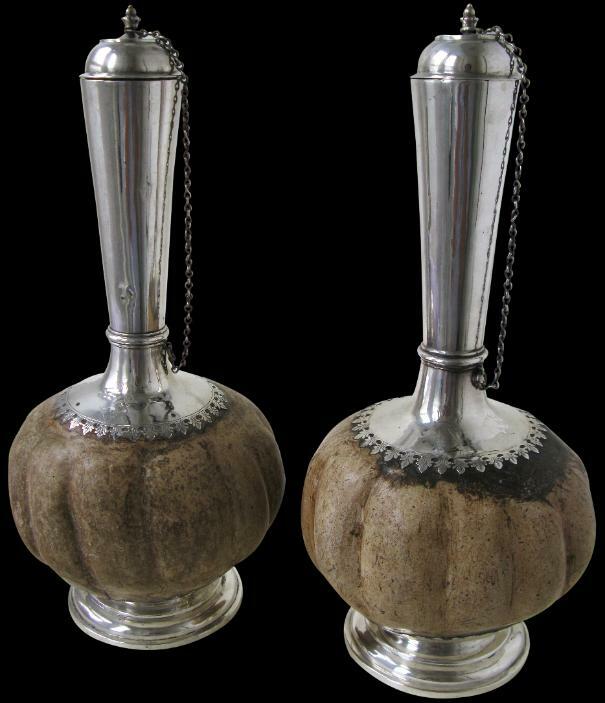 Another example with a tiered silver base, flared neck and domed cover with pointy finial and chain, and a globular grey earthenware base, was offered as lot 368 at Christie’s Amsterdam, ‘The Mr and Mrs BWG Wttwaall Collection of Fine Dutch Silver’, 10 December 2007. 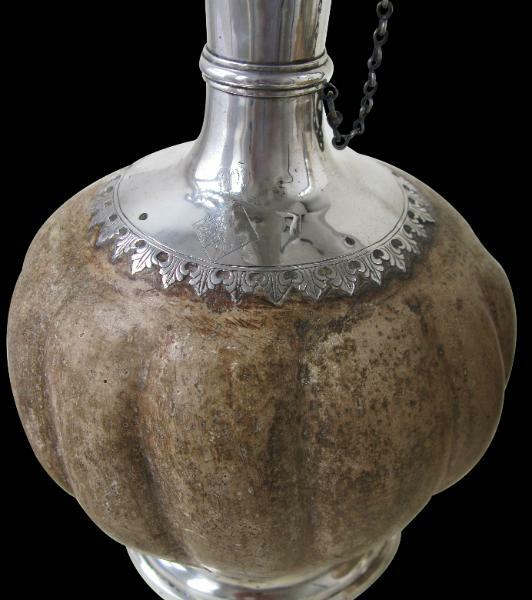 This example was catalogued as ‘A rare colonial silver-mounted earthenware flask with cover, apparently unmarked, former Dutch East Indies, 18th century’. Wassing-Visser (1995, p. 38) illustrates a pair of similar flasks with carved coconut shell bodies and with gold mounts and chains which are either Batavian, Indian or possibly Sri Lankan. The overall form again is similar to the examples here. The finials on the stoppers have a similar bud form, and the proportions are similar – the Wassing-Visser examples are 42 and 43cm high. 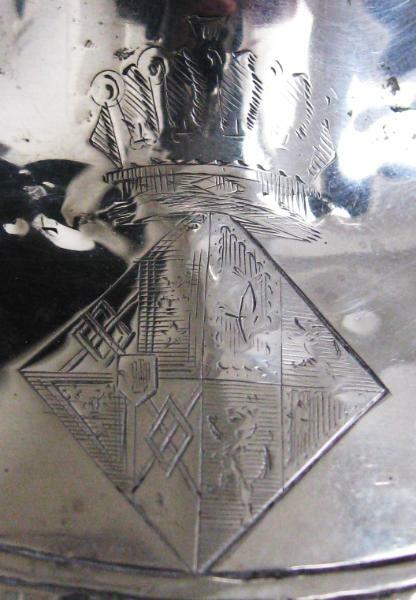 The silver mounts of both flasks are engraved with baronial arms. The arms are in a lozenge shape indicating that they are those of a widow. 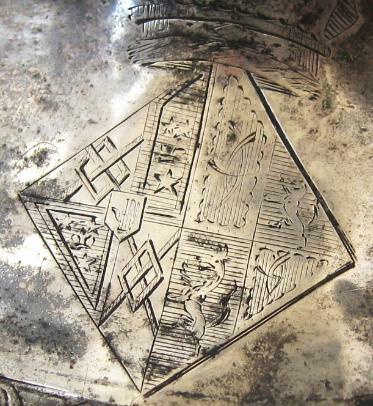 Although such arms do appear on silver, they are relatively rare. In this example, they are made up of her arms on the right, and those of her husband on the left. Magdalane (also spelt as Magdelena) Lewis was the daughter of David Lewis. She married Lionel Tollemache, 5th Earl of Dysart, son of Lionel Tollemache, 4th Earl of Dysart and Lady Grace Carteret, in April 1791. She died in February 1823. As a result of her marriage, Magdalane Lewis was styled as Countess of Dysart on from 1791. The 5th Earl of Dysart was a Scottish nobleman, also styled Lord Huntingtower from 1727 to 1770. He had seven siblings including four brothers, three of whom served in the royal navy. One of these was killed in a duel; another drowned off the coast of Lisbon. The 5th Earl’s first wife was Caroline, daughter of Sir Edward Walpole, and a niece of Horace Walpole. Caroline died at Ham House in 1789. Dysart remarried in 1791, to Magdalene, who was a sister of his brother Wilbraham’s wife. He had no children by either wife, and upon his death at Ham House in 1799 was succeeded by his brother Wilbraham. 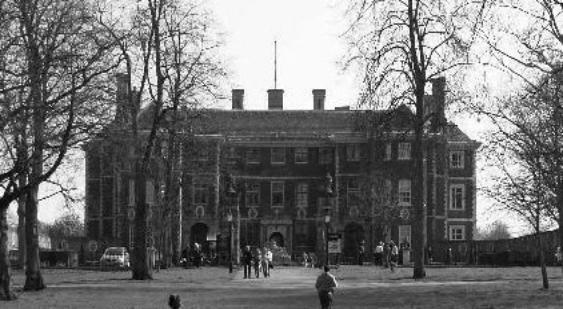 The Countess died in 1823 (the Gentleman’s Magazine of April 1823 (p. 374) reports that the Countess died at her house in Piccadilly; The Complete Peerage is more specific and gives the place of death as Hyde Park Corner), so the engraving must have been done between 1799 and 1823. The engraved arms on each of the flasks. of the Tollemache family. With no children, it is possible that on his death she felt the need to secure her position and property, so sought to have the items in her possession marked clearly as such, hence the addition of her arms to this pair of water flasks. If this is so then it is likely that the engraving dates to the commencement of her widowhood (1799) or thereabouts. There are no English records of the Countess’ arms and it is possible that either they too are Scottish or that they were assumed by her forebears without authority. Her father, David Lewis, was of Malvern Hall, Warwickshire. (Lewis engaged Sir John Soane to extensively remodel Malvern Hall in 1783, but essentially little is known of him. The family might have been more of the gentility than the nobility. It is clear that they had money and so might have had a merchant background. Overall, this pair of cooling flasks is exceptionally rare. Few such flasks made for colonial Europeans seem to have survived, and the addition of the Dowager Countess’ arms makes them even more exceptional. The Gentleman’s Magazine, various; Haags Gemeentemuseum, V.O.C. – Zilver: Zilver uit de periode van de Verenigde Oostinische Compagnie 17de en 18de eeuw, 1983; The National Trust, Ham House, 1995; Wassing-Visser, R., Royal Gifts from Indonesia: Historical Bonds with the House of Orange -Nassau (1600-1938), Waanders Publishers, 1995; Voskuil-Groenewegen et al, Zilver uit de tijd van de Verenigde Oostindische Compagnie, Waanders Uitgevers, 1998; Christie’s Amsterdam, ‘The Mr and Mrs BWG Wttwaall Collection of Fine Dutch Silver’, 10 December 2007. Ham House, Richmond, near London.